I’ve been doing some research around the area of growth recently and came across Bruce Mau’s ‘Incomplete Manifesto for Growth’, i thought he makes some very good and very appropriate points. Take a read, its pretty long, but stay with it, learn some stuff and grow along with it. The works above have been created by design agency, Music. Successfully shifting the focus from the message to the way the message is conveyed in order to reiterate that same message. 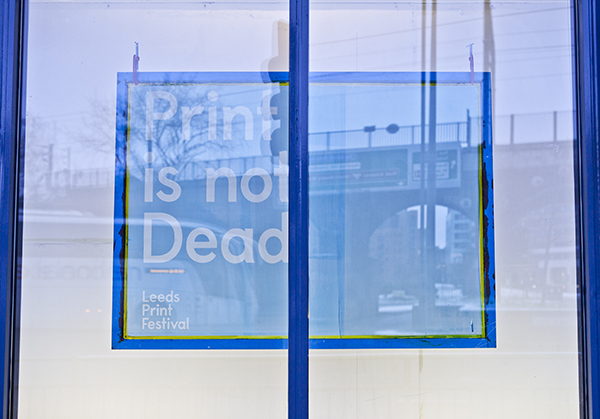 Instead of printing the designs onto a range of papers, Music created five screens to advertise the Leeds Print Festival this January. Very simple, but lovely. Check out the new Bonobo song, its lovely and comes with a real nice video compiled up of found footage from 1962 about consumerism, super nice. 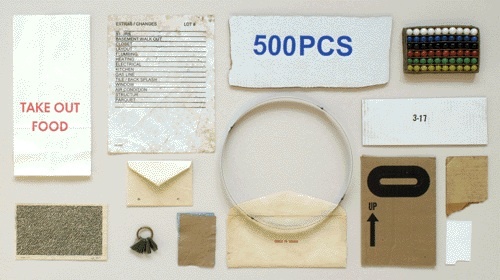 Micah Lexier’s (the artist who wrote the article in my last post) collection of objects on view for the month of January. 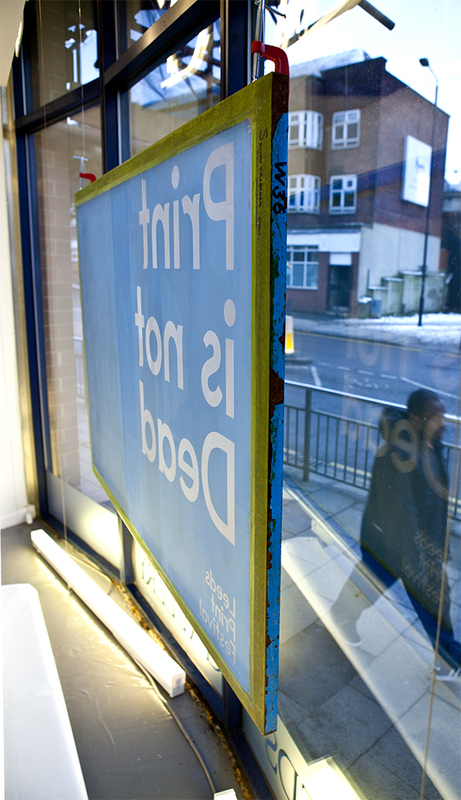 A year-long exhibition consisting of twelve consecutive vitrine displays, each lasting one month, each changed at the beginning of the month, starting January 2010. The displays consist of a selection of items including stationery, street finds, the backs of things, altered books, coins, packaging, printed cardboard, metal objects, forms, measuring devices, games, labels, and other printed materials. 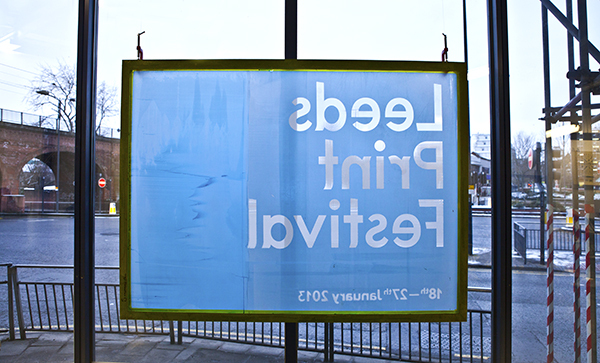 A boxed collection of twelve pamphlets has been produced in a signed and numbered edition of fifty, plus 10 artist’s proofs. Micah Lexier is a Toronto based artist. He curates occasionally and collects often – generally items made of paper, including out-of-print conceptual art documents, printed cardboard boxes, and various items found on the street. He has a deep interest in measurement, numbers, and the kinds of casual marks we make in our day-to-day lives. Lexier has presented over 90 solo exhibitions, participated in over 150 group exhibitions and produced a dozen public commissions. 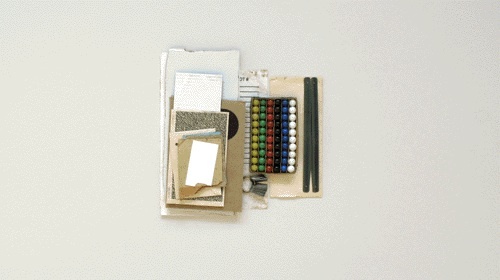 I really like the images above, and that he has simply just displayed found items to make something new and lovely. Just found this really interesting article (below) about Kelly Mark, a Canadian artist, by another artist, Micah Lexier. I thought it was really lovely and made me really interested in Marks work, all of her pieces seem to have some sort of intrinsic concept or purpose, which i really love. She seems to have an obsession with collecting and documenting, which is really nice and has made me want to start documenting/recording again. 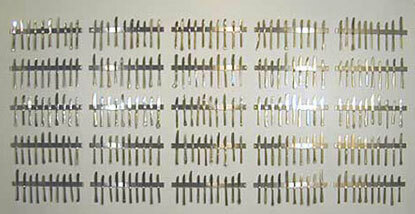 The Three knife images above seem to be her collection of butter knives, reflecting from her time as a waitress, at each exhibition the knives were displayed differently according to the site, which i think is a really lovely idea, i like the idea of your work being able to change, or become adaptable over time. I dont particularly like the final image named, ‘I really should’- this being simply a list of how she could self improve, however i just thought it was odd as i remember one bored lecture on my foundation i scribbled across a whole page of things “i want”- or wanted in my sketch book, with very similar things, freaky, alas i dont think i have the book anymore, or probably do under loads of clutter. Take a read below, its really interesting. I have the unique distinction – or so Kelly Mark claims – of being the very first person to have purchased her work. One day in 1997 Christina Ritchie and I drove out to Dundas, Ontario to do a studio visit with her. This was my first meeting with Kelly – Christina had met her several years before in Halfiax when she was a student at NSCAD. I was blown away by everything that Kelly showed us that day and I felt deeply connected to the kind of work she was making. At one point during the visit Kelly pulled a small, engraved block of aluminium out of her pocket to show us. 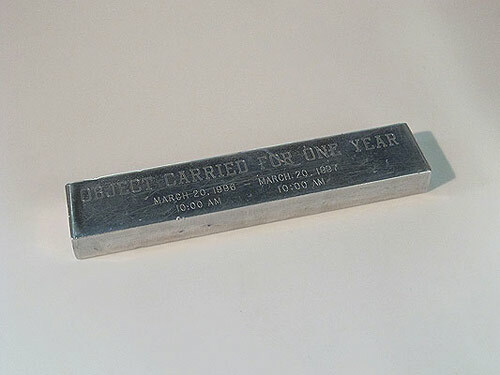 It was a work in progress called Object Carried For One Year – a simple rectangular block of aluminium that Kelly had been carrying in her pocket for almost an entire year. It was the perfect object. It was small but made of a very durable material. It was a simple geometric shape but it was subtlely marked up with scratches that bore the tale of having been carried around. It was solid but light. It was everything I valued in an object and I fell in love with it immediately. I was overcome with the feeling that I had to have that object – that it belonged with me – and right there and then I asked Kelly if she would consider selling it to me. She said that the year was not yet up, but when it was, she would let me buy it. A little while later I got a call from Kelly stating that the price would be $1,200. She explained that the price represented $100 for each month of the work’s gestation. It was a lot of money for me at the time but I felt it was fair and I loved her pricing logic. It became the first of three works by Kelly Mark that I own. The second work that came to live with me is a pencil drawing entitled Dixon (Until Series), named after the brand of pencil that Kelly used to create the drawing. It is one of three related works that Kelly made in 1997, each using and named after a different brand of pencil. On a large sheet of paper Kelly started the drawing – a dense depositing of graphite – roughly in the centre of the page and didn’t stop until all the pencil lead had been totally used up. What I love about this piece is its sense of equivalency. The work is both a drawing and a demonstration. We all know what a pencil looks like but by dispensing it all on a single page we are presented with its equivalent in drawing form – a rich, dense, beautifully unpretentious shape. 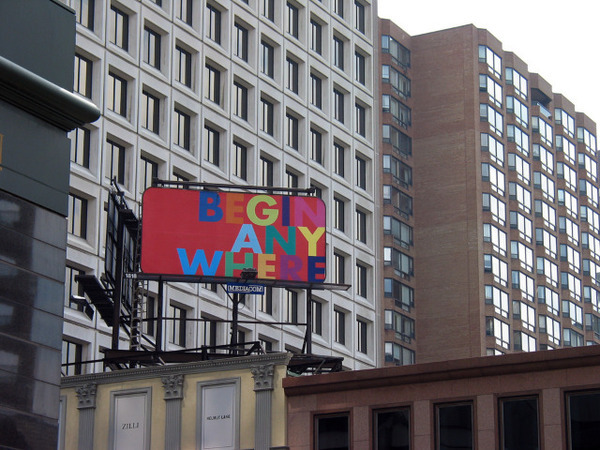 The third work, and most recent addition, is one that was completed in 2000, but I only saw for the first time in the fall of 2007 at a wonderful exhibition entitled Goin’ Postal, that Miles Collyer organized for Art Metropole. Again, the moment I saw it I knew it belonged with me. Goin’ Postal was an exhibition of works that had gone (or were made to go) through the postal system. 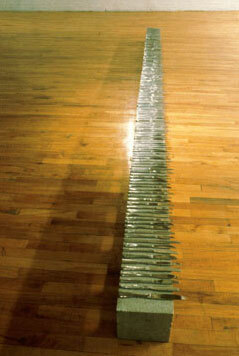 Kelly exhibited a work entitled Boomerang, which consisted of a grouping of 114 empty envelopes displayed in a vitrine. To make the work, Kelly typed the work BOOMERANG on a letter-size piece of paper. She folded that piece of paper and placed it in a standard #10 (business) envelope. She put her name and address as both the sender and the receiver and mailed the letter to herself on August 26, 1998. At the time she started the project Kelly lived right beside a mailbox and so the work acknowledges (and celebrates) the fact that the starting point and the ending point of the letter’s journey were almost identical. When this first envelope arrived at her studio a few days later, she opened it, removed the letter, put it into a new envelope, and addressed it to herself. She then mailed this second envelope from the same mailbox as the first and when this envelope arrived she repeated the process. 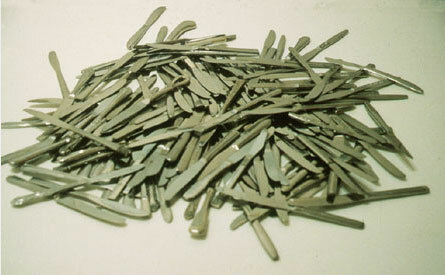 This continued until May 2000 when the 115th envelope never arrived at her studio -– thus bringing the work to a close. 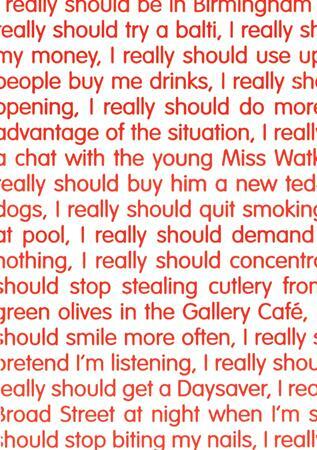 This is a classic Kelly Mark work – it is a simple idea based on something observed in daily life, religiously carried out until the work reaches its inevitable conclusion. One of my favourite aspects of this project is that the only two items that are missing are the very first thing she made (the letter with the word BOOMERANG typed on it) and the very last thing (the final envelope). Besides collecting Kelly Mark’s work, I once made a Kelly Mark work. Every year the Ontario College of Art and Design hosts a fundraising event in which they send artists postcard-sized pieces of paper and ask them to make a work for the front of the card. The cards are exhibited anonymously so we are specifically asked not to sign the front. Only after the buyer purchases the work are they allowed to turn the card over and see who made it. A few years ago when OCAD sent me the cards I wrote “KELLY MARK MADE THIS” on the front and signed it with my name on the back. I told Kelly about this a little while ago and was relieved that she thought it was funny. I only hope the purchaser of the card felt the same way.